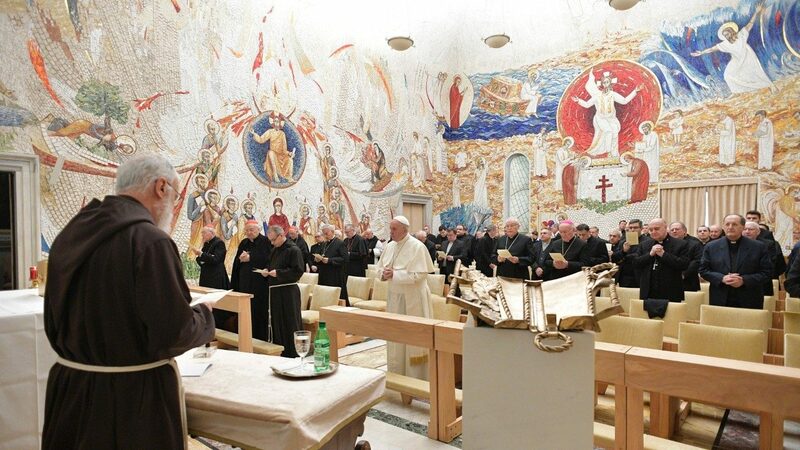 Here is the third Lenten homily given this year by the preacher of the Pontifical Household, Capuchin Father Raniero Cantalamessa. I say to everyone among you not to think of himself more highly than he ought to think, but to think with sober judgment. . . . Do not be haughty but associate with the lowly; never be wise in your own sight. These are not trivial recommendations to moderation and modesty! In these few words, the apostle’s exhortation opens up for us a vast domain of the virtue of humility. Next to charity St. Paul identifies humility as the second most fundamental value, the second area to work on to renew one’s life in the Spirit and to build up the community. In no area more than this one do the Christian virtues appear to form in us “the mind that was in Christ Jesus.” The apostle recalls elsewhere that Jesus, being divine in nature, “humbled himself by becoming obedient to the point of death, even death on a cross” (see Phil 2:5-8). And Jesus said the same thing to his disciples: “Learn from me, for I am gentle and humble of heart” (see Mt 11:29). Humility can be discussed from different perspectives, which we will see the apostle do, but in its most profound meaning humility belongs only to Jesus. The truly humble person is the one who strives to have the heart of Jesus. In the exhortations of his Letter to the Romans, St. Paul applies the traditional biblical teaching on humility to the life of the Christian community. This teaching is repeatedly expressed through the spatial metaphor of “elevating oneself” and “lowering oneself,” the tendency upward and the tendency downward. 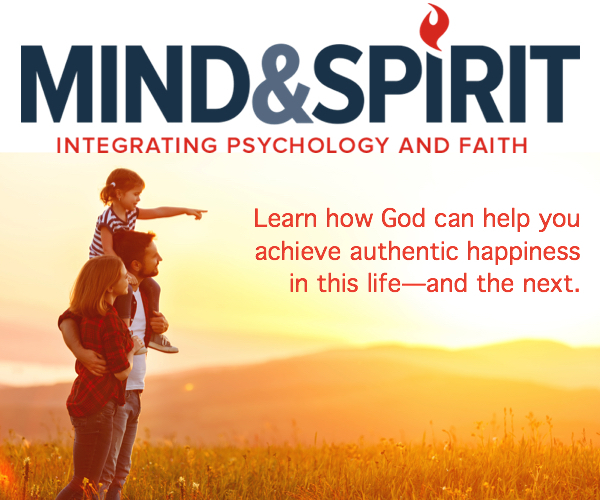 We can “aspire to things too lofty for us” (see Ps 131:1) either with our minds, through excessive curiosity that does not take into account our limitations in the face of mystery, or we can do that with our will, striving for prestigious positions and functions. The apostle has in mind both these possibilities, and his words target both the presumption of the mind and the ambition of the will. However, in transmitting the traditional biblical teaching on humility, St. Paul gives a motivation for this virtue that is partly new and original. In the Old Testament the motive or reason for humility is that “Toward the scorners [God] is scornful, but with the humble he gives favor” (Prov 3:34; see Job 22:29), and that “Though the Lord is high, he regards the lowly, but the haughty he knows from afar” (Ps 138:6). It was not explained, or at least not explicitly, why God does that, why he “exalts the humble and casts down the proud.” Different explanations can be given for that, for example, the jealousy or “envy of God” (phthonos Theou), as certain Greek writers thought, or it is simply God’s will to punish human arrogance, hubris. The decisive concept that Paul introduces in his discourse on humility is the concept of truth. God loves the humble because the humble person lives in accord with truth: he or she is genuine, authentic. God punishes pride because pride, even more than arrogance, is a lie. In fact, everything that is not humble in a person is a lie. This explains why Greek philosophers, who were familiar with and extolled almost all the other virtues, did not know about humility. The word “humility” (tapeinosis) always had the predominantly negative meaning for them of baseness, pettiness, meanness, and cowardice. Greek philosophers were unaware of the two cornerstones that would have allowed them to associate humility with truth: the idea of creation and the biblical idea of sin. The idea of creation is the basis for the certainty that all that is good and beautiful in human beings comes from God, without exception. The biblical idea of sin is the basis for the certainty that all that is evil, in the moral sense, comes from human beings, from their freedom, from themselves. The biblical person is moved to humility by both the good and the evil that he or she discovers within. But let’s turn to the apostle’s thought. The expression he uses in our text to indicate humility-truth is “sober judgment.” (sophrosune) He exhorts Christians not to have a mistaken or exaggerated sense of themselves but to have instead an accurate, sober—we could say objective—estimation of themselves. Paul repeats the exhortation again in v. 16, where “never be wise in your own sight,” finds its equivalent in the expression “associate with the lowly.” With that Paul is saying that people are wise when they are humble and are humble when they are wise. I was wondering once what Our Lord so dearly loved this virtue of humility; and all of a sudden—without, I believe, my having previously thought of it—the following reason came into my mind: that it is because God is Sovereign Truth and to be humble is to walk in truth. The apostle does not leave things vague or superficial for us regarding this truth about ourselves. Some of his concise statements, found in other letters and that follow this same sequence of ideas, have the power to remove every “foothold” from us and to make us really get to the bottom of things to discover the truth. One such text asks, “What do you have that you did not receive? If then you received it, why do you boast as if you did not receive it?” (1 Cor 4:7). There is only one thing that I have not received, one thing that is completely mine, and that is sin. I know and experience that it comes from me, that it finds its source in me, or in any case in human nature and the in the world, not in God. On the other hand, everything else—including the fact of recognizing that sin comes from me—is from God. Another verse says, “If anyone thinks he is something when he is nothing, he deceives himself” (Gal 6:3). The “true estimation” of ourselves is therefore for us to recognize our nothingness! This is the solid ground at which humility aims! It is precisely the sincere and peaceful conviction that by ourselves, we are nothing, we can think nothing, we can do nothing. “Apart from me you can do nothing,” says Jesus (Jn 15:5), and the apostle adds, “we are [not] sufficient in ourselves to think anything …” (see 2 Cor 3:5). We can use either of these sayings, depending on the circumstance, as a real “sword of the Spirit” to cut off a temptation, a thought, any self-satisfaction. “What do you have that you did not receive?” The efficacy of the word of God is experienced above all when we apply it to ourselves more than when we apply it to others. In this way we begin to discover the real nature of our nothingness, which is not a pure and simple nothingness, an “innocent nothingness.” We can glimpse the ultimate goal to which the word of God wants to lead us, which is to recognize what we truly are: a proud nothing! I am that person who “believes he is something” while I am nothing; I am the person who has nothing that I did not receive but who always boasts—or is tempted to boast—of something as though I had not received it. This is not the situation just for some people but a misfortune for all of us. This is the very definition of the “old self,” a non-entity who thinks he or she is something, a proud nothing. The apostle himself confesses what he discovered when he went down into the depths of his heart. “I discovered,” he says,” another law in me. . . . I discovered that sin dwells in me. . . . Wretched man that I am! Who will deliver me?” (see Rom 7:14-25). That “other law,” the “sin that dwells in us,” was for Paul, as we know, self-glorification, pride, boasting in ourselves. At the end of our journey of interior descent, then, we do not discover humility in ourselves but pride. However, the very discovery that we are radically proud—and that it is our fault, not God’s, because we became proud by misusing our freedom—is in itself humility because it is the truth. Having discovered what lies at the end of this journey, or even only having glimpsed it from afar through the word of God, is a great grace. It brings us a new peace, like a person in wartime who discovers that under his home, without even having to leave it, there is a secure shelter that is absolutely impregnable to bombings. A great spiritual teacher, St. Angela of Foligno, when she was close to death, exclaimed, “O unknown nothingness! O unknown nothingness! Truly a soul cannot have a better awareness in this world than to perceive its own nothingness and to stay in its own cell.” That saint exhorted her spiritual children to do whatever was necessary to re-enter that cell quickly whenever they had left it for whatever reason. We need to do what some very timid little creatures do who never leave the entrance of their hole so as to be able to reenter it quickly at the first sign of trouble. There is a great secret hidden in this advice, a mysterious truth that is experienced when we test it. We discover that a cell actually exists that we can truly enter anytime we wish. It consists in the quiet, tranquil thought of being a nothing, a proud nothing. When we are in that cell we no longer see the defects in our neighbors, or we see them in another light. We understand that it is possible, with grace and with practice, to achieve what the apostle says, although it might seem excessive at first to “humbly count others as more significant than ourselves” (Phil 2:3)—we can at least now understand how this could have been possible for the saints. To enclose oneself in this cell is completely different, though, from closing in on oneself: it is instead opening oneself up to others, to being, to the objectivity of things, which is the opposite of what the enemies of Christian humility have always thought. It is the closing of oneself to self-centeredness, not the closing of oneself in self-centeredness. It is a victory over one of the evils that even modern psychology judges to be deadly for a human being: narcissism. The gospel presents us with an unsurpassed model of this humility-truth, and it is Mary. In the “Magnificat” Mary says that God “has looked upon his handmaid’s lowliness” [in the Latin Vulgate, humilitatem, humility!] (see Lk 1:48). But what does the Blessed Virgin mean here by “humility” (tapeinosis)”? It does not refer to the virtue of humility but to her humble state, or at least that she belongs to the category of the humble and the poor that her canticle speaks about next. This is confirmed by the explicit reference to the canticle of Hannah, Samuel’s mother, where the same word is used (tapeinosis), and it clearly refers there to Hannah’s misery and barrenness, her lowly condition, not to the attitude of humility. The difference between the virtue and the condition is clearly obvious. How is it possible to think that Mary is exalting her own humility without thereby destroying her humility? How is it possible to think that Mary is attributing God’s choice of her to her humility without destroying the gratuitousness of that choice and making all of Mary’s life incomprehensible, beginning with her Immaculate Conception? To stress the importance of humility, someone has foolishly written that Mary “does not recognize in herself any virtue except humility,” as if in this way we were giving great honor to that virtue rather than causing great harm to it. The virtue of humility has an altogether special status: people who have it do not believe they have it, and the people who think they have it do not. Only Jesus can declare himself to be “humble of heart” and truly be so. This is the unique and unrepeatable characteristic of humility in the man-God. Did Mary, then, not have the virtue of humility? Of course she had it, and she had it to the highest degree, but only God knew it, not Mary. Precisely this, in fact, constitutes the unparalleled value of true humility: its perfume is perceived only by God, not by the one who emits it. Mary’s soul, free from every real and sinful concupiscence, facing the new situation created by her divine maternity, quickly and naturally came to the point of truth—her nothingness—and nothing and no one could have dissuaded her from that. Mary’s soberness is beyond compare even among the saints. She was able to handle the tremendous pressure of this thought: “You are the mother of the Messiah, the Mother of God! You are what every woman among your people would have desired to be!” Elizabeth had exclaimed, “Why is this granted to me that the mother of my Lord should come to me?” (Lk 1:43), and Mary responds, “He has looked upon his handmaid’s lowliness!” (see Lk 1:48). She submerged herself into her nothingness and “exalted” only God, saying, “My soul magnifies the Lord” (Lk 1:46)—the Lord, not the handmaid. Mary is truly the masterpiece of God’s grace. Claiming to put to death our own pride and striking it down by ourselves without anyone intervening from the outside is like using our own arm to punish ourselves: we will never quite hurt ourselves. It is like wanting to excise a tumor by ourselves. There are people (and I am certainly among them) who are capable of saying—even sincerely—every bad thing imaginable about themselves, people who, during a penitential service, make self-accusations with admirable frankness and courage. But if anyone around them begins to take their confession seriously, or if they dare to mention to them a small part of what they said on their own, sparks fly. Obviously there is still a long road ahead to arrive at true humility and humble truth. When I seek to receive glory from someone for something I say or do, it is almost always certain that the same person seeks to receive glory from me for what he does or says in response. And so we are both seeking or own glory and neither one of us obtains it. And if, by chance, one of us receives it, it is only “vainglory,” empty glory fated to go up in smoke at death. But the result is just as terrible. Jesus even linked the seeking of one’s glory with the impossibility of believing. He said to the Pharisees, “How can you believe, when you receive glory from one another and do not seek the glory that comes from the only God?” (Jn 5:44). When we find ourselves enmeshed in thoughts and aspirations for human glory, let us throw into that mix of thoughts, like a burning torch, the word that Jesus himself spoke and has left us: “I do not seek my own glory” (Jn 8:50). This word has the almost sacramental power of bringing to pass what it signifies and to dispel such thoughts. Vanity is so deeply rooted in the heart of man that a soldier, a churl, a cook, a picklock, boast and many have admirers; and philosophers expect to have them too; and those who write against them want to enjoy the reputation of writing well; and those who read them want to enjoy the notoriety of having read them; and I, who am writing this, have perhaps the same desire; and perhaps those who will read it. Vainglory is able to transform even our striving for humility into an act of pride, but with grace we can come out victorious even from this terrible battle. If in fact your “old self” can succeed in transforming your acts of humility into acts of pride, with grace, your acts of pride can be transformed into acts of humility by your acknowledging them—humbly acknowledging that you are a proud nothing. God is thereby glorified even by your very pride. In this battle God usually comes to help his people with a remedy that is quite effective and unique. St. Paul writes, “to keep me from being conceited because of the surpassing greatness of revelations I received, a thorn was given me in the flesh, a messenger of Satan, to harass me” (2 Cor 12:7). In order for human beings to be kept from “being conceited,” God grounds us with a kind of anchor: he attaches “burdens on our back” (Ps 66:11). We do not know exactly what the “thorn in the flesh” and the “messenger of Satan” were for Paul, but we know very well what they are for us! Anyone who wants to follow the Lord and serve the Church has them. They are the humiliating situations that we are constantly reminded of, sometimes night and day, which recall the harsh reality of what we are. It might be a defect, an illness, a weakness, or a powerlessness that the Lord allows us to have despite all our pleading. It might be a persistent, humiliating temptation and perhaps precisely a temptation to pride! Perhaps it is a person we have to live with, who, despite the good will of both parties, is able to expose our frailty, to demolish our self-conceit. Sometimes it is something that is even more serious: there are situations in which the servant of God is forced to witness helplessly the failure of all his efforts and to see things that are bigger than he is that make him experience firsthand his powerlessness in the face of the power of evil and darkness. It is especially in these cases that he learns what it means to “humble yourself under the mighty hand of God” (see 1 Pet 5:6). Humility is important not only for personal progress on the path to holiness, it is also essential for the proper functioning of community life and for the building up of the Church. I believe that humility is insulation for the life of the Church. Insulation is very important and vital for advances in the area of electricity. In fact, the higher the tension and the more powerful the electric current that goes through a line, the more resistant the insulation must be to prevent the current from being discharged into the ground or causing short circuits. Advances in the area of electricity have to be matched by similar advances in the technology of insulation. In spiritual life, humility is the great insulation that allows the divine current of grace to flow through a person without dissipating or, worse, producing the flames of pride and rivalry. Let us close with the words of a psalm that allow us to transform into prayer the exhortation that the apostles addressed to us with his teaching on humility. my eyes are not raised too high. Teresa of Ávila, Interior Castle, VI, ch. 10, vol. 2, Complete Works of St. Teresa of Ávila, trans. and ed. Allison Peers (New York: Burns & Oates, Dover, 2002), p. 323. St. Angela of Foligno, The Book of the Blessed Angela of Foligno (Instructions), in Complete Works, trans. Paul Lachance (Mahwah, NJ: Paulist Press, 1993), pp. 315-316. St. Anthony the Great, Selections from the Sayings of the Desert Fathers, trans. Benedicta Ward (Kalamazoo, MI: Cistercian Publications, 1975), p. 8. Martin Luther, “The Magnificat,” trans. A. T. W. Steinhaeuser, vol. 21, Luther’s Works, ed. Jaroslav Pelikan (St. Louis, MO: Concordia, 1956), pp. 308, 311. Thomas à Kempis, The Imitation of Christ, 2, 1, trans. Joseph N. Tylenda (New York: Vintage Classics, 1998), p. 50. Blaise Pascal, Pascal’s Pensées, trans. Martin Turnell (New York: Harper & Brothers, 1962), p. 134; Braunschweig ed., #150.